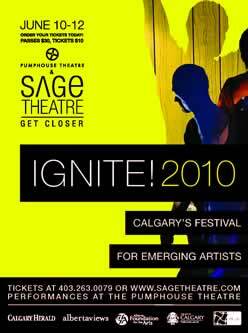 I have been meaning to take in IGNITE!, which is Sage Theatre's festival of emerging artists, for years now. But somehow those three days in June always seem to fill up in nanoseconds and the opportunity passes me by yet again. So when the RO and I were offered the chance to volunteer at the 6th annual IGNITE! festival, we said hell yeah. In exchange for ripping tickets during three performances, we got a tee-shirt, an invitation to a wine and cheese opener and final night after-party, and most importantly, the chance to see some of the performances. What a deal. Although we had previous commitments preventing us from coming back to see plays on other nights, we were able to watch two sold-out dramatic performances and the first installment of the music series on opening night. I was really taken with the first play, Destroy. Two best friends, disenchanted with their lives in Calgary, take a road trip, looking for adventure and their true home. With their destination unknown, they let themselves be guided by their whims and their dwindling pocketbooks. WIth a minimum of props being used with maximum ingenuity, Destroy relied upon solid writing, brought to life by believably natural performances. The narrator, Simon, and the instigator/driver, Tom, encounter hostile border guards, Mexican shop owners, and willing women, all of whom are portrayed with disturbing authority by the backing musicians. The second play of the evening, Waiting on the Thunder, was less successful. The story of an increasingly brutal encounter between a self-described soccer mom and her ex-boyfriend didn't really work for me. The acting, perhaps the result of too much scenery-chewing, felt very acted to me. And I had a difficult time suspending my disbelief during the flip-flopping of intentions between the two characters. The two musicians we heard during the evening's Music Series could not have been more different from one another. Chris Beaudry opened with an acoustic set of highly personal songs. Although obviously heartfelt, the original songs did all start to sound very much the same after a while, and I felt that the 30 minute set would have benefitted from some variation in his song choices. He did have a strongly enthusiastic following in attendance, though, which was very nice and made me feel less badly about drifting off into my own thoughts during his set. I did enjoy the originality of Lindsay Brandon's set. A one woman performer who goes by the moniker Information Agent, she played short quirky songs accompanied by arty visuals projected against the brick walls of the room. Using looping instrumentals which she produced from equipment set up on a vintage ironing board, she accompanied her quite lovely voice with building looping harmonies. I'm not entirely sure how Information Agent's music would translate into digital form, but with the accompanying visuals, it was quite compelling. I wish I had not waited so many years to finally take in Sage Theatre's IGNITE! festival, because obviously I have been missing some exciting new work coming from emerging artists. Some of it was more successful than the rest, granted, but it's always exciting to see fresh new work. Sounds like a fun and adventure for you and the RO. The free t-shirt would be enough of an incentive for me(my wardrobe is getting a bit thin these days) but getting to see the performances would definitely seal the deal. verification word = "zygric", which we all know is premiering at next year's IGNITE festival, an engaging one person play about the turmoils of a martian named "Zygric" who shares his often humorous observations about humanity made during his five year exile on earth. The last commenter makes a good point. It sounds like fun. I can't possibly beat Anon's comment. The wardrobe perks are certainly nice, Matthew. The tees that one gets for any sort of volunteering do tend to be more suitable for boys, with the man-cut and the writing across the back, so I generally pass them along to the menfolk in my life. They appreciate them! I will look for Zygric at next year's IGNITE, tell the playwright he owes you royalties. It was fun, Mr Anchovy, always nice to try something different. Always great to get the sweet volunteer gigs. I don't know, Beckeye, he says the same thing about everything. We have an agreement - he leaves Taiwanese spam, I delete the hell out of it.